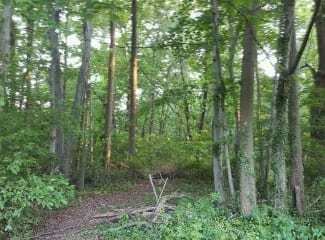 Baltimore County Councilman David Marks announced on Wednesday that he will recommend the downzoning of a heavily-wooded property off Oakleigh Road once slated for development. In October 2009, Baltimore County approved the development of a 22-unit housing development between Oakleigh Road and Perring Parkway. The “Clearwood Park” project was approved based on the underlying zoning, despite objections from neighbors who criticized the development’s impact on traffic and the character of the community. The project was approved before Councilman Marks’ election to the County Council. Since 2009, the developer has failed to finalize the details necessary to build the project. Councilman Marks initiated a zoning change last fall, and held a community meeting Tuesday night to solicit input from the community on what should happen next. Councilman Marks anticipates recommending that the seven-acre parcel be downzoned from DR 5.5, or more than five houses per acre, to DR 1, or one house per acre. The owner is based in Florida.